Amateur games are of a breed that I have avoided mentioning, mainly because they tend to be human moderated games of a simple nature. These games are generally run by PBM fanatics with a little spare time and money. 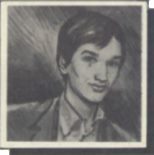 The principal of amateur gaming is the same as in ‘professional’ PBM, which after all, developed from amateur PBM — the only difference is that the results of all the players’ orders are published together in a ’zine (normally in the form of a table of figures for the players to interpret). These games are very cheap to play — the only charges being a couple of pounds startup and a few more pounds for a ’zine subscription. Turnaround varies from every three weeks to every two months, depending upon the ’zine. If you are interested in playing any of the variety of amateur PBM games available (many of them derived from board games such as Diplomacy, Sopwith and Railway Rivals), or if you would like any further information about amateur gaming, then I suggest that you send an SAE to Martin Le Fevre along with a letter asking him for details of the amateur PBM game directory which he edits. And Lloyd has passed a letter from David and Michael Bradley on to me — they’ve got three games on offer: a cowboy game, a football game and a space game which are apparently free to play so long as you send SAEs along with your turnsheets. The games are meant for beginners and people who want to play by mail in a simple way, so if you’re interested, send a SAE to David and Michael for details. Soccer Star is the first PBM game to be released by Pace Games Software of Nottingham. As this is a new game, a fair appraisal cannot be given so all that can be said is that Soccer Star appears to be a fairly detailed professional PBM game of Football Management. The game offers a league structure, player skill ratings (ranging from Park Player to World Class), team selections, player transfers, weekly matches, aggression factors (defining how your team plays! ), game attendance figures, financial management, professional cheating and so on... All in a day’s work for your average Bobby Charlton! Soccer Star is due to be launched this month, costing £3 to start up, with game costs of £1.25 per turn (which can be as often as weekly if you wish). Send an SAE for further details to CRASH Soccer Star, Pace Games Software. Conquest is a human moderated game of, well, conquest. The land of Rall upon which the game is played is mapped out onto well over 10 A4 sheets, each sheet containing 29 hexes of land and sea. Initially, the player is given a nation compromising of a few hexes, and is told the type of nation ruled, the ‘Personalities’ owned, the nation’s religious and magical tendencies and troop strengths, along with information regarding the hexes and cities governed. The player is also given a copy of the (somewhat daunting) rulebook. The main nation types are: barbarian; nomad; superior barbarian and civilised. Each type of nation has its own advantages and disadvantages. For example, a superior barbarian nation can raise civilian population at 80% of the normal economic costs, while its prosperity is low compared to that of a civilised nation. The personalities are the leaders of nations and armies, and they are used by the players to actually ‘do’ things in the game — conducting spying or espionage missions, trading and so on. Normally the player has about 10 personalities, but this figure can vary. They all have ‘Dungeons and Dragons’ style attributes which give different Personalities different uses. Nations’ troops generally come under two headings: INFANTRY archers and marines for instance, and CAVALRY which may comprise chariots, elephants and so on. The nation type and geographical description decides the troop type of the nation. Fleets of ships such as galleys and coastal raiders are available for maritime battles. Combat in Conquest is a well thought out affair — victory does not necessarily go to the largest force! 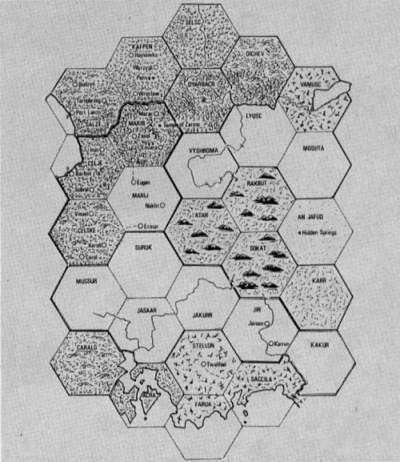 The player’s hexes and cities are termed PROVINCES. In the provinces, loyalty-crushing taxes can be enforced to raise the gold needed for economic development and investment in infrastructure and armies. Economics is the strongest feature of Conquest, and international trade is an important key to successful play. A map from CONQUEST in which the aim of the game is... conquest! Conquest’s a well run game which requires a lot of careful planning and diplomacy to win. The game is quite difficult to understand at first, but after a few months play and a bit of diplomacy with experienced players you should get used to the game. A word of warning if you choose to join: don’t expect the world to be easy! Conquest is played on a monthly turnaround and each turn costs only £1. Startup costs £3, and as a special offer to CRASH readers this fee includes an extra free turn not normally included in the startup package (rulebook and first turn free). Matthew Brunt, who GMs Conquest, also produces an informative game newsletter called The Conqueror — well worth reading and why not contribute articles too?